Blake Andrews is a photographer based in Eugene, Oregon. Since 1993 he has photographed his surroundings prolifically, making more than 250,000 negatives. He divides this substantial body of work into a various sub-projects. In some of these efforts he works within predetermined parameters, as in one series centering on his family. In others he responds more loosely to his environment, as in sets of images that catalogue the formal play of lines in the landscape or the recurring shape of the arrow in ordinary signage. 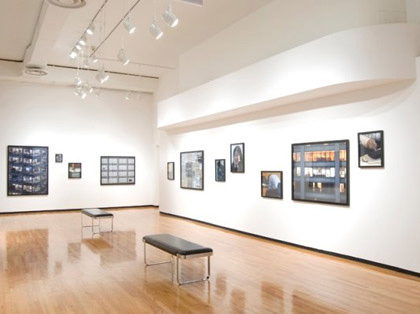 Andrews made the photograph held in MoCP's collection while traveling in New Orleans with his family in 1999. 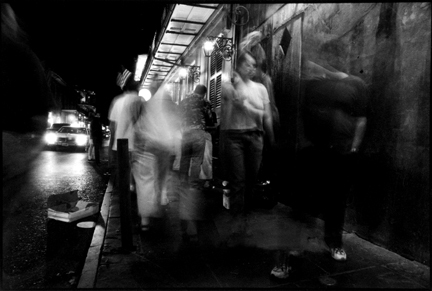 Shot on Bourbon Street with a long exposure, the image tranforms his wife and father into ghostly forms that hover in the foreground of an atmospheric urban night scene.